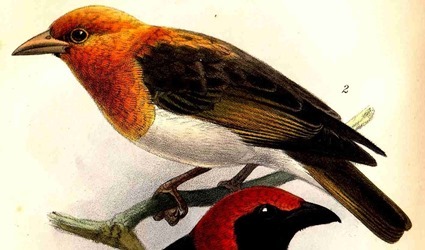 The Red-headed Weaver was formally described by Carl Jakob Sundevall, a Swedish zoologist employed at the Swedish Museum of Natural History, Stockholm. He described many new birds collected in southern Africa by Johan August Wahlberg and sent to the Swedish Museum. The Red-headed Weaver was collected by Johan August Wahlberg, a Swedish naturalist and explorer. Wahlberg collected at least 5 specimens of the Red-headed Weaver in Oct-Nov 1843 while hunting for big game around Mohapoani - these mountains are now known as the Witfonteinrant Mountains, SW of Thabazimbi in Limpopo Province. Wahlberg travelled in southern Africa between 1838 and 1856, sending thousands of natural history specimens back to Sweden, and several birds and animals were named after him. He was killed by an elephant he wounded while exploring the Okavango area in Botswana. Wahlberg did not collect the first Red-headed Weaver specimens. Two specimens were collected in Senegal by an unknown collector by 1839 and sent to paris where they were described as a new species by Frederic de Lafresnaye in 1839. The name used was invalid, however, and thus Ploceus melanotis became a subspecies. Read more here. 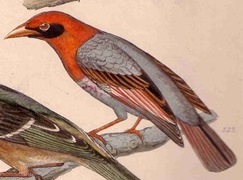 The first illustration of a Red-headed Weaver is by Lafresnaye 1839, followed by a colour painting published by Reichenbach 1863 - these both featured the northern subspecies, thought to be the nominate form at the time. The first illustration of the southern African race was published in Elliot (1876). Ploceus (Hyphantornis) rubriceps	Sundevall 1850	Oefv. K. Sv. Vet.-Akad. Forhandl., vol. vii, p.97	'Caffraria superiore'; type from Mohapoani, Rustenberg district, W Transvaal (Gyldenstolpe, 1927, Ark. Zool. vol. 19A(1), p.12). rubriceps - Latin: ruber, red; -ceps, headed. 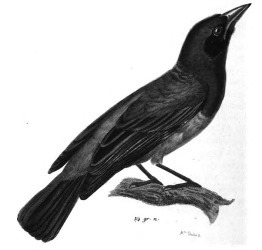 The black-eared Coucou-Weawer; The red-headed Coucou-Weawer (Reichenbach 1863). Ayres's Weaver, Black-eared Scarlet Weaver, Gurney's Weaver Bird, Jubaland Anaplectes, Masked Red Weaver, Red Winged Anaplectes, Red winged Weaver, Scarlet-headed-Weaver, Yellow-winged Anaplectes. around Mohapoani = Witfonteinrant Mts, SW of Thabazimbi in Limpopo Province. Three type specimens are in the Swedish Museum of Natural History and photos and details are on the web: NRM 568683, NRM 568684, and NRM 568685. Two type specimens are in the Berlin Museum, ZMB_7281 and ZMB_7282. Identification. The Red-headed Weaver Anaplectes rubriceps, a striking weaver bird with bright red head in the breeding plumage of males. In West and East Africa the male has a black mask; one race in East Africa has a red plumage. The female is yellowish or brownish. Both sexes have a distinctive thin pinkish orange bill. There has been some confusion about the scientific name of this species, which is Anaplectes rubriceps (read more here). Distribution. This species is one of a handful of weavers that is widespread on the African continent, being found in woodland in West, East, central and southern Africa (see map below, based on Birds of Africa). In northern South Africa it is present at a low density. Many subspecies have been described and 3 are currently recognised. A. r. leuconotos is found in Mali, Burkina Faso and Ghana east to Nigeria, Cameroon, Chad, Central African Republic, Sudan and Ethiopia, also in DRCongo, Uganda, Kenya and Tanzania (yellow on map). The male of this race has a black mask around the eye; both sexes have the margins of the remiges, wing-coverts and rectrices red, not yellow. A. r. jubaensis is found in Somalia and coastal Kenya (green on map). The male is distinctive with the entire plumage red except for a black face, black edges to the scapulars, and blackish wing and tail feathers (broadly edged with red). A. r. rubriceps is found in Angola, DRCongo, Tanzania, Zambia, Malawi, Mozambique, Namibia, Botswana, Zimbabwe, South Africa and Swaziland (red on map). The male has a red head, breast and upper back and yellow wing and tail edgings. Habitat. The Red-headed Weaver inhabits broad-leaved woodland, bushveld, miombo and acacia savanna in subtropical to tropical moist regions. It is also found in gardens, especially on farms. Local movements between habitats occur seasonally in Botswana when some of its preferred deciduous habitat becomes inhospitable during the dry season. Food. The Red-headed Weaver feeds mainly on insects, including beetles, grasshoppers, mantids, Hemiptera bugs, and termites. It also feeds on spiders (e.g. social spiders Stegodyphus), fruit (e.g. mistletoe and figs), seeds, and snails. The young are fed on insects and spiders. The Red-headed Weaver is usually solitary or in pairs, but also joins mixed bird parties for feeding. It forages mainly in trees, bushes and creepers among foliage, on dry fruit capsules and along branches, often hanging upside down. The foraging height in trees is 7.9 m high on average. It pecks at spider nests to extract spiders; and hawks insects in the air. Breeding. The Red-headed Weaver is polygynous, and sometimes monogamous. It has a distinctive nest that is constructed of flexible twigs, leaf petioles and tendrils (rather than green grass as in most Ploceus weavers). Several nests may be present at one site, consisting of nests of previous breeding seasons. Sometimes it is colonial, and large colonies have occasionally been reported (see report about largest colony here). Nests are usually built in trees, including baobabs. This species often builds its nests on man-made structures, including telephone lines and the roof edges of buildings. Old nests are often left hanging and may be used for breeding by other birds, especially Cut-throat Finches. Nests are often associated with raptor nests. Incubation of the blue eggs is by both sexes, mostly by the female. The young are fed by both adults. The Red-headed Weaver is an occasional host to the Diederik Cuckoo (Chrysococcyx caprius). 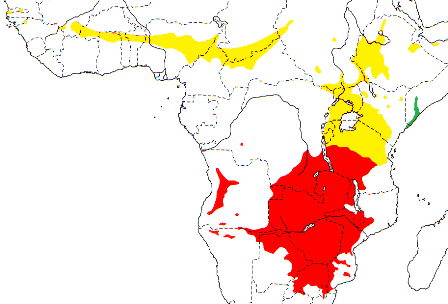 Red-headed Weaver, Range-change map between SABAP1 (1987-1991) and SABAP2 (2007-current). In South Africa the Red-headed Weaver has more grid cells with increases in reporting rate than cells showing decreases, between SABAP1 (1987-1991) and SABAP2 (2007-). 2. 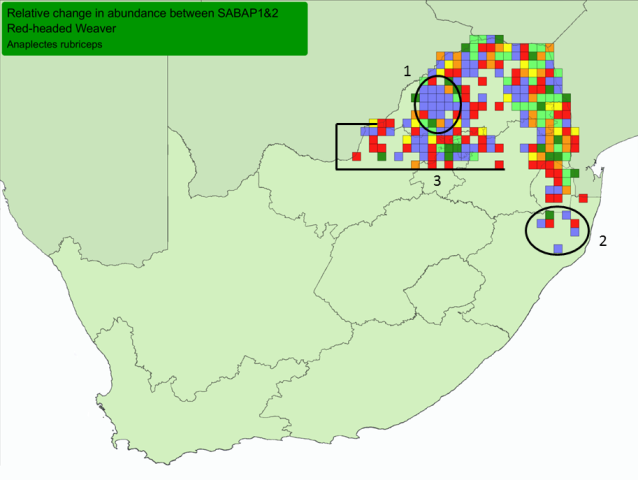 Zululand, KwaZulu-Natal - new vagrant records show as blue grids, and vagrant records from SABAP1 are red. 3. It occurs at low density between 24 and 26 S.
Guinea: Pinselli Forest Reserve, range extension (Demey 2012b). Kenya: Changoto woodlands near Dakatcha, range extension (Demey 2011a).